(CBS News) During a fundraising swing in New York next week, President Obama will tape an appearance on CBS' "Late Show with David Letterman." It will be Mr. Obama's seventh appearance on the program, and his second as president. Previous presidential candidates have taken advantage of the late-night comedy circuit to show their lighter side. Then-candidate Bill Clinton made a lasting impression during his appearance on the Arsenio Hall show during his 1992 campaign when he played "Heartbreak Hotel" on the saxophone. 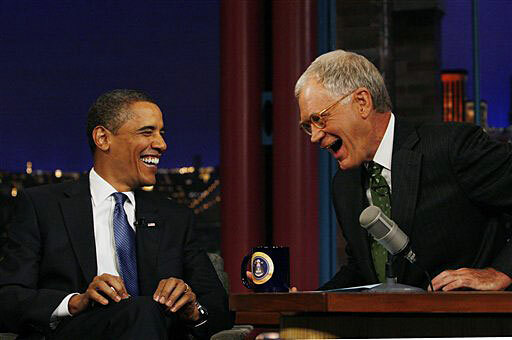 Mitt Romney has also appeared on "Late Night," but fewer times than Mr. Obama. He has sat down for an interview once and presented Letterman's "Top 10" twice. More often, Romney is the center of Letterman's jokes. Letterman has crafted a caricature of Romney, often calling the Republican candidate "Mitch" and mocking his affluence. Letterman also shows a regular segment called "Ann and Mitt Romney's Lies," which questions the couple's claims about buying clothes at Costco, doing laundry and engaging in other everyday activities.